On September 11, 2001 the United States of America was attacked by terrorists. Al Qaeda and the Taliban found safe haven in Afghanistan. Our nation, at war, deployed units into Afghanistan to destroy Al Qaeda and remove the Taliban. Beginning in January of 2005, the 173rd Airborne Brigade was called in support of the Afghanistan mission, Operation Enduring Freedom VI. The "Sky Soldiers" participating in Operation Enduring Freedom VI, consisted of Paratroopers, Soldiers and Airmen from, Headquarters and Headquarters Company, 173rd Airborne Brigade, 1st Battalion, 508th Infantry (Airborne), 2nd Battalion, 503rd Infantry (Airborne), 74th Infantry Detachment (Long Range Surveillance), 173rd Support Battalion (Airborne), Delta Battery, 3rd Battalion, 319th (Airborne) Field Artillery Regiment, Combat Support Company, the 3rd Battalion, 319th (Airborne) Field Artillery Regiment of Fort Bragg, and embedded coalition partners from Romania, Canada, United Kingdom, and the Netherlands. The Brigade worked in concert with several other partner nations and various US Army units including 3rd Special Forces Group, 7th Special Forces Group, elements of 1st Battalion, 325th Parachute Infantry Regiment, and Task Force Storm the multi purpose aviation task force. The Brigade and all of Combined Task Force (CTF) Bayonet were under the command of Colonel Kevin C. Owens, 173rd Airborne Brigade Commander, and Command Sergeant Major Arthur J. McCann III the Brigade Command Sergeant Major. Spearheading the deployment in February 2005, Task Force Fury consisting of 1st Battalion, 508th Infantry (Airborne) and D Battery, 3rd Battalion, 319th (Airborne) Field Artillery Regiment, deployed in support of Regional Command East along the Afghanistan-Pakistan border basing their operations out of the Province of Paktika. The remainder of the Brigade deployed to Regional Command South based primarily out of Kandahar Airfield and operated from eighteen satellite bases spread across Zabol, Helmand, Oruzgan, and Kandahar Provinces. This entailed moving and sustaining the Brigade across tremendous distances by helicopter, vehicle and foot, as well as continuous decentralized operations at the platoon and squad level partnered with elements of the Afghan National Police and the 205th Corps from the Afghan National Army. The "Sky Soldiers" helped to reconstruct and rebuild Afghanistan by ensuring a safe and secure election for the people of Afghanistan as they voted in the National Assembly Elections in Regional Command South and East. "Sky Soldiers" provided security and support for numerous Provincial Reconstruction Teams throughout the area of operations which helped to rebuild infrastructure and greatly enhanced the quality of life for all Afghans. The Brigade achieved several operational objectives during its twelve-month deployment to Afghanistan including the handover of Regional Command South to a multi-national Brigade led by the Canadian Army. This print is dedicated to those Soldiers, both past and present, who served with and supported Combined Task Force Bayonet and The 173rd Airborne Brigade. 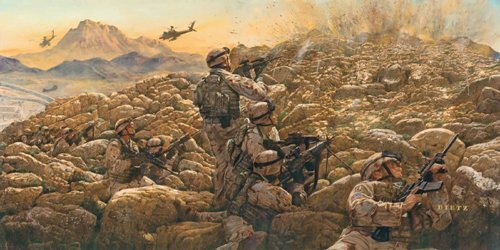 During Operation Enduring Freedom VI, 22 members of CTF Bayonet made the ultimate sacrifice during combat with insurgents and terrorists protecting Afghan citizens and preventing the return of oppression and tyranny to a devastated populace. The aggressive spirit of the American paratrooper was evident in every operation CTF Bayonet executed. The "Sky Soldiers" gained and maintained the initiative living among the people, seizing terrain where the enemy once roamed freely, and conducting over 100 deliberate air assaults and over 400 cordon and searches resulting in numerous "troops-in-contact." The call of "troops in contact" was heard frequently across the Brigade's tactical satellite net meaning that "Sky Soldiers" had once again engaged the insurgents and the enemies of Freedom were about to pay a dear price. Thus, the name of the print - "Sky Soldiers in Contact."